A great view is a great thing…. Except when that great view is in to your home. While a nice balcony is a must for many condo owners and city dwellers, it can be tough to enjoy your space when it feels too exposed. 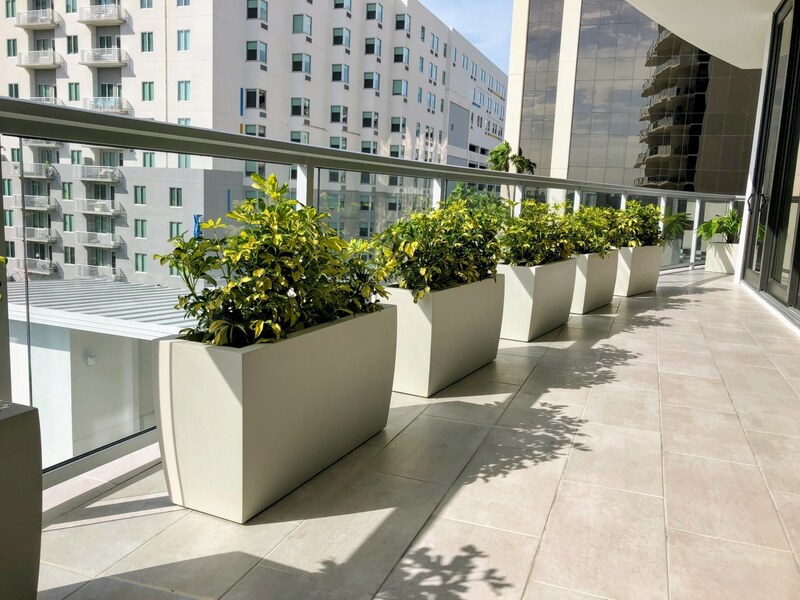 The right privacy plantings can help provide coverage and create a more personal, intimate feel on your balcony and in your home without obstructing the view you love. Here’s what to consider when looking at privacy planting options. Generally, a little elevation for your plantings is a good thing–but too much and you’ll risk losing any view at all. Hip-high or so planters do a good job of softening a view and creating a more private environment. Choose mid-height shrubs to add some additional height with more coverage. If your concern is exposure from above (i.e. another apartment or condo across the street), a taller, wind-hardy selection may be in order. Avoid anything too top-heavy, and select a more more sizable container to allow your planting to achieve height. 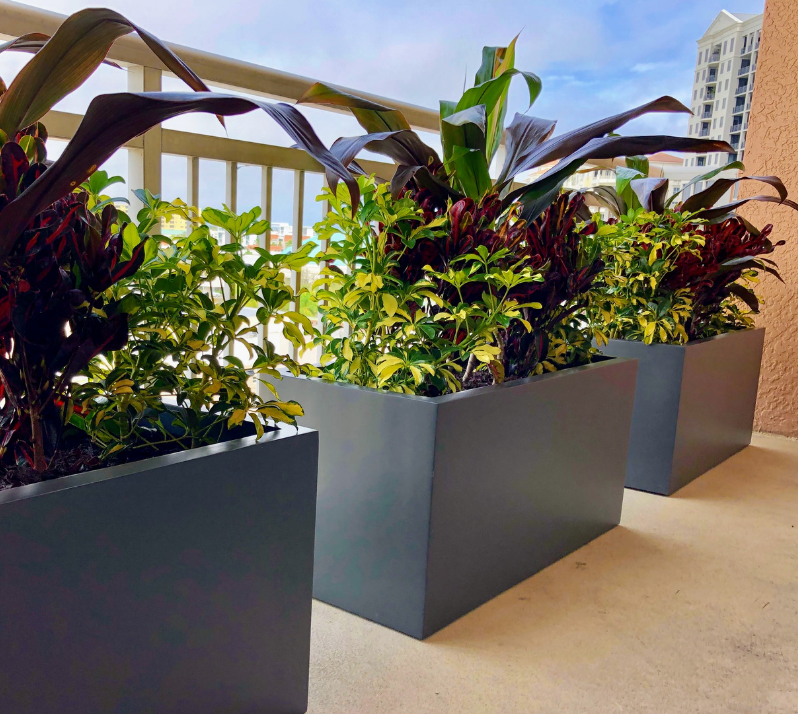 Many taller, rectangular planters have relatively narrow bases, which is bad news on outdoor balconies for two reasons. First, you need a container that can withstand the weather. Anything too narrow will tip, even with rock or other weighted material in the base. Second, narrow planters limit the type, height, and longevity of the plants you’ll be able to use. Some condos may require plants to be moved indoors during certain weather events, such as hurricanes or tropical storms. If this is the case, it’s good to make sure you have planters in a material like fiberglass that are going to be relatively easy to move. Privacy plantings are generally in the least protected parts of balconies, on the edges where they are exposed to sun, wind, and for many in our region, salt. It’s important to pick plants that can tolerate these conditions and thrive, especially because they will be so visible. For the most coverage, think bushy shrubs–a mono-culture can look very chic and modern. To add in color, consider smaller succulent bowls or sun-hardy flowering varieties in more protected areas of your balcony. Alternately, mix in colorful foliage plants with shrubbier varieties to get a pop of color while still having a solid barrier. Interested in exploring privacy planting options for your balcony? A professional plantscaper can help you select the right varieties to achieve the protection and style you want, and will have the experience to know what holds up in your locale. In the Sarasota-Bradenton area? Give us a call for a free consult!